Abstract: Bobo is a male neutered Corgi presented for back pain and pelvic limb ataxia. Bobo was treated with acupuncture and showed improved comfort in his spine, but limited improvement in his neurological deficits. Bobo is a 14-year-old male neutered Welsh Corgi farm dog with a history of back arthritis that has been slowly progressive. In the past few months, he has developed ataxia in his pelvic limbs. Years ago, radiographs of his spine revealed significant arthritis in his back according to the owner. He has been on Galliprant 60 mg once daily, with little improvement in his comfort. At home, Bobo prefers to lay down against the wall or other solid objects to push off of when standing. He no longer jumps in the owner’s golf cart and has had worsening ataxia in his pelvic limbs. The owner has noted sores on the dorsal aspect of both hind feet from dragging his toes. His owner is reluctant to take him to the vet for further evaluation due to his severe anxiety and aggressive behavior in the clinic setting. For this reason, the owner has not sought further diagnostics and is hesitant to use medications that would require regular bloodwork. Bobo’s physical exam was within normal limits. No overt lameness is present with normal range of motion in both thoracic and pelvic limbs. On neurological exam, he showed moderate ataxia in the pelvic limbs. There was prominent delayed conscious proprioception (CP) bilaterally with the left worse than the right. His nails and dorsal aspects of his digits were callused from scraping on the ground in both pelvic limbs. Thoracic limbs appeared neurologically appropriate. Sciatic, patellar, and biceps reflexes were normal bilaterally. Bobo’s myofascial exam revealed myofascial restriction, pain, and flattened hair coat on his dorsal spine from his eighth thoracic vertebra 8 (T8-L5) to his fifth lumbar vertebra. There was some decrease in the span of thoracolumbar (TL) pain after treatment. He also tends to be sore in his triceps muscles and quadriceps muscles bilaterally. points were used to stimulate tibial, fibular, and femoral nerves. Additionally, points were placed to relieve myofascial strain patterns in the triceps and quadriceps muscles. SI 11, SI 12 – placed bilaterally for trigger point deactivation BL 15, BL 21, BL 25, BL 26- placed bilaterally to decrease local pain/inflammation GB29- placed bilaterally for peripheral nerve stimulation (cranial gluteal nerve) to aid in CP, and local trigger point deactivation. Third Treatment (11/9/17): Continued moderate- severe TL sensitivity. Ataxia unchanged and prominent scuffing of dorsal toes present on the left limb. Needles used: serin 0.20x 30 mm at all points except E-stim connectors, where Hwato 0.20x 25 mm. GV 14, GV 20, BaiHui BL 11- placed bilaterally E-stim BL 19- BL 26 2 Hz for 10 minutes with ITO unit BL 40, BL 60 Bafang points placed in left hind limb only- for tibial and fibular nerve stimulation to promote increased CP. Fourth Treatment (11/18/17): Continued moderate sensitivity in thoracolumbar spine. Additionally, soreness noted in quadriceps muscles and triceps muscles. Needles used 0.20 x 25 mm Hwato’s. GV 14, GV 20, BaiHui Trigger points in triceps muscles- placed bilaterally ST 34, ST 36- placed in left hind for periphearal nerve activation and trigger point relief. BL 27- bilaterally for stimulation of origin of tibial and sciatic nerves bilaterally Estim BL17- BL 25 at 2 Hz for12 min with ITO unit Huatuojiaji points- on alternating sides between BL 17 and BL 25 for increased pain relief and central nerve stimulation. Fifth Treatment (11/28/17)- Continued pain in TL spine. The owner was not available to hold Bobo so treatment was performed with no assistance and fewer points were able to be placed. Owner also started him on T-relief. Needles used 0.20 x 25 mm Hwato’s. GV 14, GV 20 Estim BL17- BL 25 at 2 Hz for10 min with ITO unit Huatuojiaji points- on alternating sides between BL 17 and BL 25 for increased pain relief and central nerve stimulation. Sixth Treatment (12/5/17): Continued thoracolumbar sensitivity and triceps soreness. Used 0.20 x 25 mm Hwato needles. Additional neck and triceps muscles message was performed. GV 14, GV 20, BaiHui BL 11 and trigger points in triceps muscles-placed bilaterally Estim BL17- BL 25 at 2 Hz for 10 minutes followed by 5 mintues at approximately 200 Hz with Ito Unit. BL 60- placed for peripheral nerve stimulation (tibial and fibular nerves) Attempted LR 3- for added peripheral nerve stimulation but was kicked out immediately. Bobo had experienced thoracolumbar pain for years in addition to the slow worsening of his ataxia. 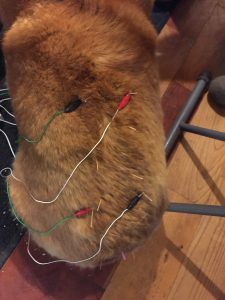 After his first acupuncture treatment, he was noticeably less sensitive to palpation of his back. In the evenings after his treatment, he would become very lethargic and would have worsening of his ataxia. Typically, after 12-24 hours he would be back to himself and seemed to the owner to be more comfortable. Before acupuncture, he would lay next to a wall or chair and lay on his right side to use his right hind leg to leverage himself up. After the second treatment, the owner noticed that he would tend to lay more in the middle of the room and was starting to jump in to the golf cart that he previously required help. His owner noted after the third and fourth treatment that he seemed to have more energy. The ataxia remained present with no change in his conscious proprioception. At each exam he continues to be painful in his T-L spine with incremental improvement. After the fourth treatment Bobo was started on Traumeel (T-relief) that aided in his improved overall comfort. However, it has not been enough as Bobo continues to require weekly acupuncture sessions for pain relief. An attempt was made to extend the interval between treatments and the owner noted that after 7-8 days he would start to act uncomfortable and lethargic again.